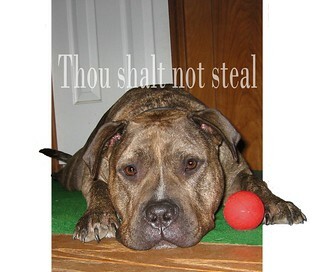 Our introduction to the pit bull breed came when I rescued a stray pup many years ago. He was a brindle-coated friendly fellow, ready to stay with anyone who showed him love. I found him in at my oldest son’s place of employment. It was a cold, icy winter day, and this klutzy puppy just wanted a place to get warm. I opened my car door, preparing for the drive home, and the dog beat me in and curled up on the front seat of my car. I couldn’t find it in me to put him out and leave him in the parking lot to freeze, so covered him up with a blanket and took him home. It was a long holiday weekend, so I knew he was ours until the following Tuesday. I took a lot of grief for this unwanted visitor, but by Tuesday morning, it was apparent the puppy had possibly found his forever home. We went through all the normal channels to find his owner, but none ever came forth. After months of holding our breath, Dawg became part of the family. Dawg even developed his own fan club. People would stop by, greet us, and then ask for Dawg. We figured he was more popular than us. 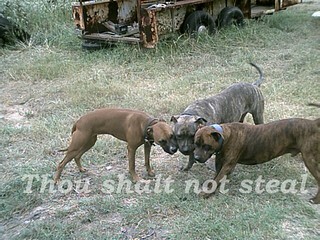 We were owned by several pits over the years. We found them to be mischievous rascals that kept us laughing. We never knew what shenanigans these dogs could come with. Easily trained and faithful, they constantly surprised us with their pranks. Pits can be made to act ugly, but even those dogs, once rescued from such a life, can be rehabilitated into great pets or even therapy dogs. It’s too late to convince us all pits are bad dogs, we know better. Just like any other dog, pits need structure and boundaries and love to flourish. The heifers and the horse and donkey eat different greens, so I swap their pastures to get the best weed eating available from these critters. There is a problem. The run-in shed for the horse and donkey is no longer in their pasture. General doesn’t care; he’s going to eat; period. Mutt, on the other hand, hates getting wet. 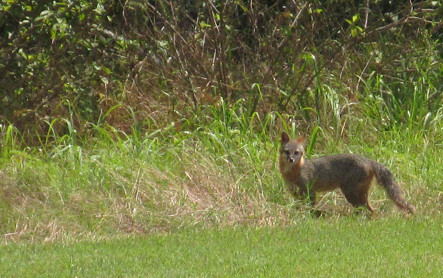 During the rain this afternoon, I checked on the two of them and poor Mutt was standing under a small tree in an effort to stay dry. He did have company so it wasn’t a total loss. Evidently the cattle egret wasn’t crazy about getting wet either. Mutt still got wet, whereas General never missed a beat. He grazed on, letting us know nothing would interfere with his eating schedule. 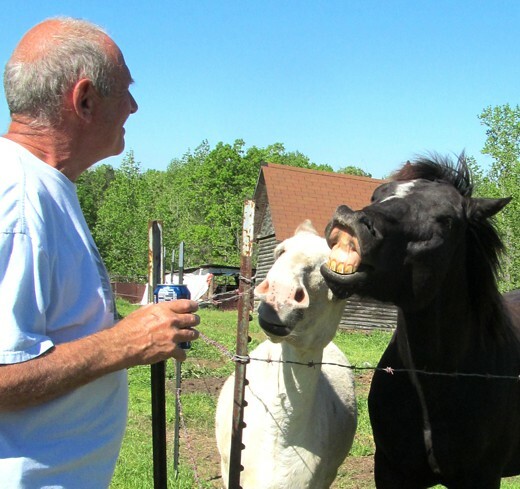 In 2010 we visited Safe Haven Equine Rescue and Retirement Home in Gilmer, Texas, and brought home my big buddy, General. Some of the horses they rescue are in such bad shape there is little hope of recovery, but Richard and Debbie Fincher do a wonderful job saving all that are humanly possible to save. 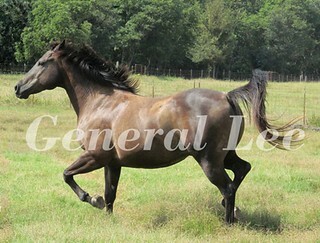 When General was found he was dragging 30 feet of rope. He will always carry the scars around his legs and hooves from that abuse; but overall, he’s actually in great shape. So many of Safe Haven’s rescues have fared very much worse, and just the effort to save them all is such a heartbreaking burden for the Finchers and their volunteers. 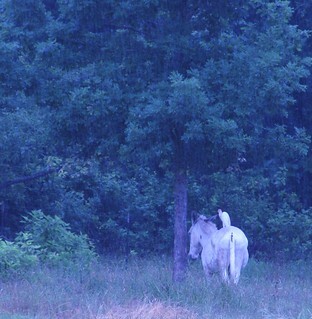 Like all other animal rescues, Safe haven always has needs for the horses. Horses are always hungry, and the Safe Haven vet bills are beyond anything you or I would run up. This is my personal pitch to you. If you love horses, or animals in general, please consider helping this worthy rescue. Your entire donation will go to the horses. I have included links to their two web sites so you can do your own investigation, but I can and do vouch for this rescue. Visiting them in person is such a sad/happy event. Sad because some people have no business owning an animal, especially a horse; and happy because the care they are now receiving is the best available. And they are loved, sometimes for the first time in their lives. This has been a year of snow in the New England area of this country. I guess my relatives got sick of it and sent a batch down here. Thanks guys! We had a ball playing in the snow, including tossing a few snowballs. We rarely get snow so yes, we do act like a bunch of kids when we have some. The dogs were not happy but they adjusted. When you’re only about 6 inches tall, squatting in the snow to potty is a real challenge. Hopefully this year the Mockingbirds will return to nest in the rose bush. That would be the bush I forgot to cut back earlier this year. 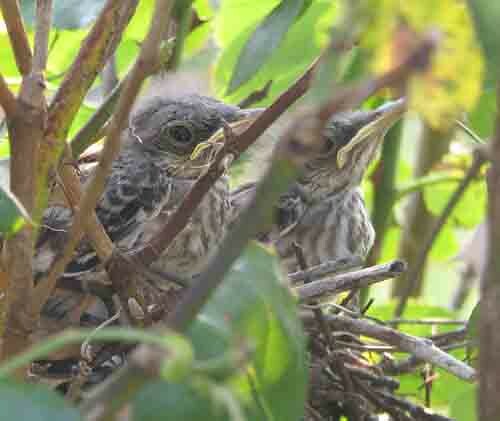 The first year the birds nested in the rose bush I watched with anticipation. They labored just outside my office window, giving me full view of their nest building efforts. Once the eggs were laid I chanced a peek into the nest while momma was off doing whatever it was she needed to do. Three eggs! I made it a habit to check egg progress at least once a week so I wouldn’t miss the newly hatched babies and I wasn’t disappointed. The featherless bodies looked like just a beak and little else. From the way the parents kept up a running buffet that seems to be a fair assessment of the babies. I watched daily until little feathers appeared and the youngsters became more active. One afternoon I had just sat down at the computer when I noticed the Mockingbird parents dive-bombing the bush, screaming and protesting. Something was terribly wrong. I dashed outside and cautiously peeked into the bush. The nest was empty. With a sinking feeling I looked around until I spotted a chicken snake wrapped around the bottom of the rose bush. It was evident she had just consumed something and there was nothing to be done. I called my husband outside so he could move the snake into the wooded area beside the house, out of harm’s way. The following year we started playing this same song all over again, but once the eggs were laid I intervened in a roundabout way. Snakes don’t like sulfur and normally won’t cross it. I put down a barrier, a ring of powdered sulfur all the way around the base of the rose bush. And again, once the constant feeding was going on I would go peek. I started speaking to the baby birds while the parents were out shopping for more groceries and the little birds seemed curious about the strange noise directed at them. The babies became accustomed to my voice and even as they grew older and could hop from branch to branch, they tolerated me just inches from them. This would be the year the youngsters would fledge, one by one, proving we don’t have to kill in nature to intervene. Years ago I brought home a tiny kitten that grew (and grew) into a huge cat. His name is Mr. Ted E. Bear, Teddy for short. He feels his calling in life it to terrorize Cooter, our min pin who happens to weigh in at the same weight as the cat. 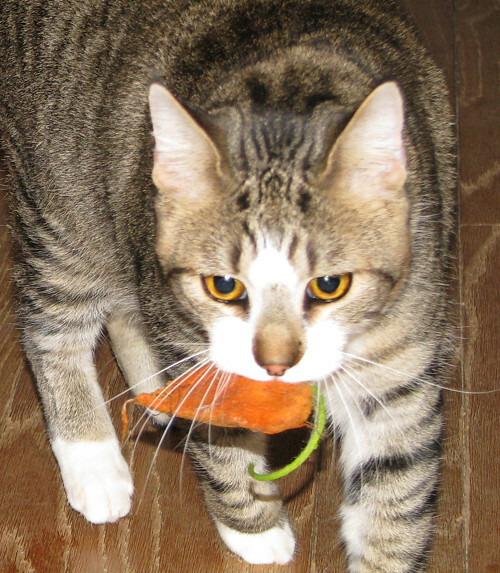 When he is not chasing the dog, Teddy likes to play with his orange mouse, a toy he gutted long ago. We have to keep an eye on this action. Teddy doesn’t like a dirty orange mouse so if he finds the toilet lid open, he launders his mouse in the fresh water. His back-up is the dog’s water bowl should the toilet be unavailable. The hazard here is should you step on this soggy mouse in the dark it is a most unpleasant experience. So at our house we have “potty patrol” to make sure all the toilet lids are closed because of a neat-nik cat. Nelson needs to quit telling Mutt and General corny jokes! Hell has moved to Texas. We have spent days watching the sky only to have our worst fears materialize before our eyes, smoke. We are on fire here with no end in sight. We have fire personnel from several states, the National Guard and borrowed equipment from anyone that will lend it and still these fires are not contained. We have had no appreciable rainfall since the month of April and everything is the driest we have ever seen it. 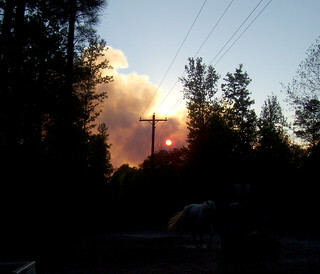 Over 30,000 acres have burned north of Jefferson and we have a fire less than half a mile from our home. 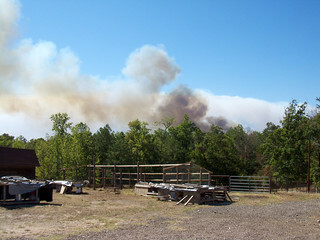 There are several more fires in northeast Texas, most of them uncontrolled and running wild. There is no rain in the forecast at all, so we are on our own. Friends have already lost their homes and many more have been evacuated to shelters. People who have no experience fire fighting are out there with tractors or other farm equipment attempting to help stop this inferno. Why is northeast Texas burning so? Because most of the rest of the state has already burned. Disaster Texas style. That’s the only description I can give our daytime temperatures right now. Yesterday we hit 107, the actual temperature, under the carport. Under the rabbit pen roof it was 120 degrees. 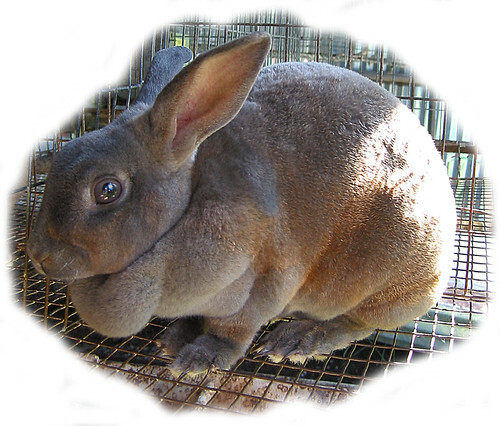 We have only our breeding rabbit stock this time of year and they are dropping dead no matter what we do. We have lost some of our best rabbits and today may wipe out most of the rest. The chickens aren’t doing any better. We water mist the critters often, all the while we’re doing that we have to remove those who haven’t survived. It’s just heartbreaking. I’ve frozen water in margarine dishes to put into the rabbit pens in an effort to keep them alive. It must help but it’s only a temporary fix. What makes this tough is there is no end in sight and it is supposed to be hotter today than it was yesterday and hotter yet tomorrow. Update: We have slowed death’s march through the rabbits and chickens, but how damaged are the survivors? It will take weeks for them to recover if they can, and there Is no reason to believe we won’t lose more. It’s really sad when anything under 100 degrees begins to sound good to us. It’s been so long since we have had any rain lakes and bayous are dangerously low, but we’re not as dry as south and southwest Texas. Cattlemen there are selling off their cattle. There is no grass and hay can’t be found at a reasonable price. It has to be hauled from out of state and the added cost makes it just out of reach for most. We desperately need some relief.